One, two, three, four, five, six, seven… Yes, exactly seven steps before he stopped, hesitated for a few moments, then removed his shoes one by one and arranged them neatly side by side on the shoe rack. 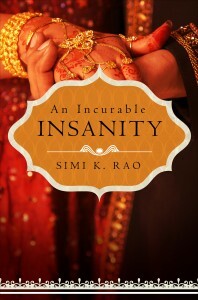 To learn more about the author and her work and read excerpts from An Incurable Insanity, please check her blog www.simikrao.com. Also visit Goodreads, Barnes and Noble, or Amazon.com. Simi K. Rao was born in India and has been living in the United States for several years. This book is her first foray into writing. The inspiration for the story came from what she has seen transpire among and within the immigrant community. Some of the experiences included are her own; some have been garnered from friends and casual conversations with acquaintances. She also writes poetry, is an avid photographer, loves to travel, and is a practicing physician. She currently lives in Denver with her family. Connect with Simi on her website, Twitter, Facebook and Goodreads.